One day, you or someone you love may need daily living assistance or monitored medical care. Are you ready for that day? What can you do now to prepare for it? What can you do today to plan for your or a loved one’s long-term care? Dean’s story teaches important lessons about the value of smart wealth management, the need to have candid family conversations regularly, and why you need to ask plenty of questions before settling on a care facility. I’m going to tell Dean’s story in three parts, each illustrating an important wealth planning principle. It was a 100-degree day in July. Dean had his air conditioning set to 72 degrees, but the AC sometimes gives him the chills. On this day, he turned the AC off, sat down and fell asleep. Dean remembers being delirious and coming to when the phone rang. Unfortunately, it was out of reach and he couldn’t answer it. Then, “Meals on Wheels” buzzed his condo intercom, but he couldn’t get up to let them in. Dean was becoming severely dehydrated and his kidneys were beginning to fail. The “Meals on Wheels” driver called the county Aging and Disability Resource Center which, in turn, contacted Dean’s daughter, who contacted emergency services. Thankfully, Dean survived. He had developed Rhabdomyolysis, a potentially life-threatening syndrome that can lead to renal failure, brought on by his prolonged immobilization and muscle compression. Dean spent a week in the hospital. Next came several weeks of physical and occupational rehabilitation therapy. Then, with little time to decide, he and his family made a frantic search for new living arrangements. 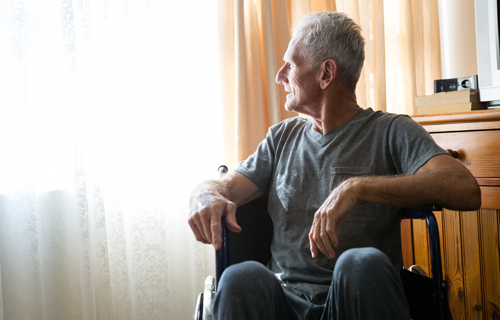 Barely able to walk, and not knowing how to prepare nutricious meals for himself, Dean realized he could no longer live alone in the condo. Throughout his professional career in advertising, Dean worked closely with a wealth manager. He saved money and built a diversified portfolio of mutual funds, individual stocks and real estate. Besides having this investment portfolio, Dean entered retirement mortgage-free with multiple fixed-income sources, which included a monthly social security benefit, a Veteran’s Association check and a retirement benefit for his adjunct professorship at a state university. Of course, Dean’s financial life changed after his episode. He had medical and rehab bills, and he needed to pay for assisted living services. Prior to that infamous July day, Dean’s monthly income exceeded his expenses by $1,500. But now his expenses had quadrupled. His monthly bills exceed his income by $3,000. Fortunately at this stage of his life, Dean had a balanced, fixed-income portfolio, largely insulated from stock market volatility. He could afford his new expense structure for many years to come. “This is what we’ve been planning for all along,” Dean’s advisor told him on a visit. Save money. Try to set aside 10% of your income each month. If not 10%, how about at least 5%? Work with an advisor. An advisor will help you to develop an investment plan suited to your age, needs, goals and lifestyle, and will review the plan with you regularly. Do your tax planning. Reducing your exposure to taxes can contribute significantly to the growth of your nest egg. Work with a tax specialist to get this job done. My firm can recommend a professional to help you if needed. In Part 2: Estate Planning, we’ll look at how Dean took control of his legacy intentions years before his summer day episode. Preparing legal documents to help fulfill your intentions is a key step in the wealth planning process. Stay tuned for that discussion. ← Is the bull market in stocks heading for a correction?